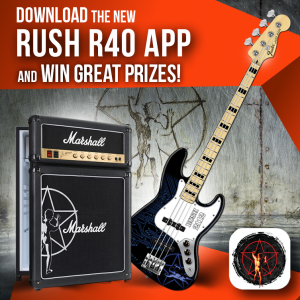 Hey Rush Fans, there is a new FREE Rush R40 App available for download in the iTunes App Store. And there’s more, download the app today and participate in our R40 App contest for the opportunity to win a Custom 2112 Fender Signature Model Geddy Lee Jazz Bass Guitar or a Limited Edition Rush Starman Marshall Fridge! All valid entries will be entered into a draw to win one of the above prizes. The winners will be notified by Instagram direct message in early November. (See contest rules & regs).